The Carpenter Performing Arts Center, located on the campus of Cal State Long Beach, presents a musical journey through Ireland in a moving and memorable concert experience by one of the leading traditional Irish ensembles Danú in a St. Patrick’s Day Celebration. 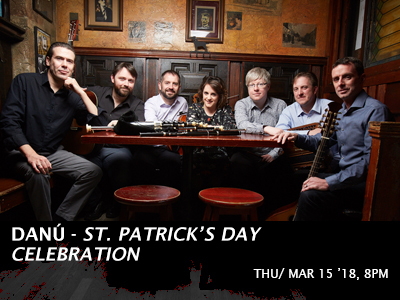 Known for high-energy performances, Danú blends the ancient music of Ireland with a new repertoire in a glorious mix of contemporary Irish sound. In celebration of St. Patrick’s Day the Carpenter Center concessions bar is serving Guinness beer along with the full bar menu!